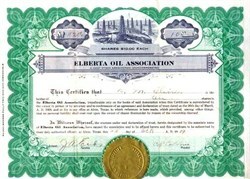 Beautifully engraved Certificate from the famous Elberta Oil Association issued in 1919. This historic document and has an ornate border around it with a vignette of oil fields. The certificate is in nice condition and well centered. The scan image make the folds look much worse than they are on the certificate. This document also has a rasied gold corporate seal with the Texas Star embossed. This item is hand signed by the company president, C.P. Collins and is over 81 years old.